BloomSky has developed a new style of weather station which uses digital cloud computing to provide you with a more accurate local weather forecast directly on your smartphone using the BloomSky companion application. The BloomSky ‘hyperlocal” weather station enables users to share real-time data and sky images via a crowdsourced network. Watch the video after the jump to learn more about the BloomSky weather station project and see it in action. The BloomSky weather station consists of both an indoor and outdoor wireless module which is equipped with an ultra wide angle HD camera with built-in 45 degree adjustable shooting angles and which turns on at dawn and off at dusk. The weather station has five senses making it capable of measuring temperature, humidity, barometric pressure, UV exposure, and precipitation. The BloomSky weather application supports both Android and iOS devices and enables you to access data collected from BloomSky outdoor and indoor module as well as view snapshot taken by the BloomSky camera, which automatically updates every 3-5 minutes. 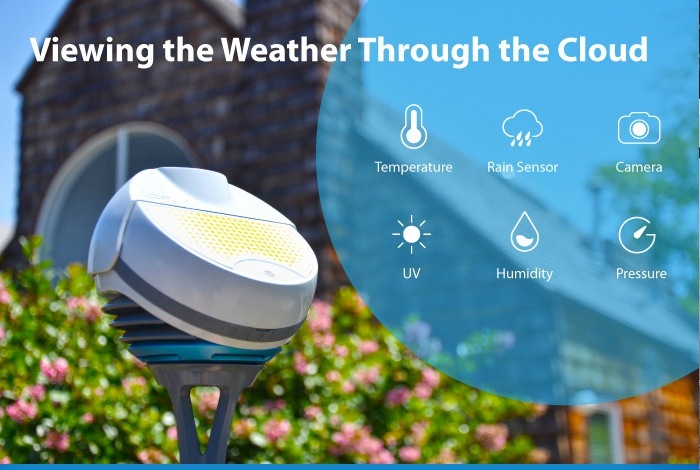 For more information on the new BloomSky cloud weather station jump over to the Kickstarter website to make a pledge and help the project become a reality.